For a fuller story, check on The Jury Rhododendron Legacy – written for and published by the RHS in 2011. In the 1950s when Felix and Mimosa were laying out and planting the new gardens at Tikorangi, rhododendrons were a high prestige plant. Felix imported a number of rhododendrons, both species and hybrids, from the northern hemisphere but it was his disappointment with the number which did not like the warm and moist conditions of coastal Taranaki which started him plant breeding. As with many keen gardeners, Felix would have concentrated on growing the species if he could grow them well. But many species can be tricky, touchy and downright disappointing in less than ideal conditions whereas hybrids bring new vigour and reliability. Cold climate rhododendrons in Taranaki often suffer from the lack of a proper winter chill. They may flower well but the foliage can be ratty and tatty with leaf burn and silver leaves and plants can even go into gradual decline and fade away. The silver leaves are caused by a native thrip which infests the underside of the leaves, sucking out the chlorophyll. We prefer to avoid the use of chemical sprays in the garden and the quest for the last five or more decades has been to breed for plants which will tolerate warmer conditions and keep healthy foliage without spraying. 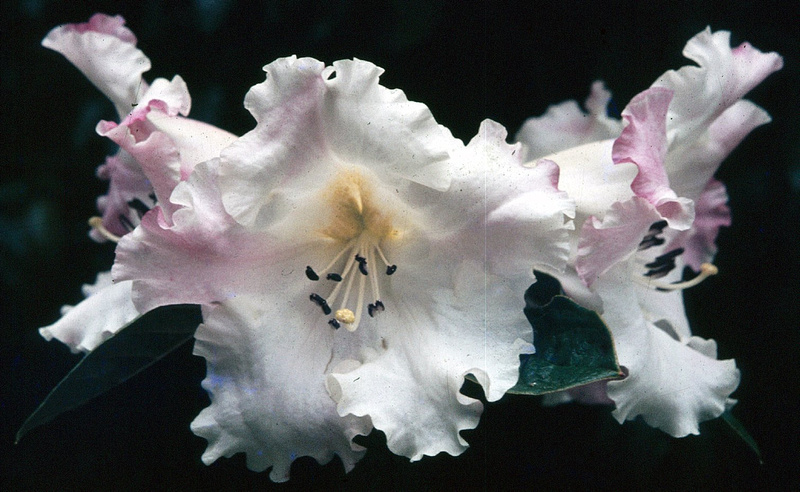 Most of the Jury rhododendrons are notable for being high health performers with mass flowering. Abigail Jury (yakushimanum x Dido) Felix Jury hybrid. Never widely released because it proved difficult to propagate. In bud the flowers are soft apricot pink, opening to frilly ivory white with green and orange spotting. Outstanding foliage. 1.2m. Late. Barbara Jury (polyandrum x Sirius) Felix Jury hybrid. Beautiful Naples yellow trumpet flowers with orange yellow inner throat. Scented. Good dark foliage with smaller leaves, typical of this breeding, but needs good drainage. 2m Late. Felicity Fair (polyandrum x Sirius) Felix Jury hybrid. Lovely pastel apricot trumpets with pink flush and orange throat. Scented, upright and vigorous. Good foliage, very dark and almost leathery. 2.5m Mid-Late. Floral Dance (sino nuttallii x edgeworthii) Felix or Mimosa Jury hybrid (both claimed it as their own). An outstanding plant. Beautifully frilled trumpet shaped flowers are white with lobes flushed pink and a yellow throat. Four to five flowers per truss with each flower some 12.5cm across. Strongly scented. Heavy textured, dark, bullate foliage with red stems. 1.5m Mid-Late. Floral Gift (Michael’s Pride x polyandrum) Mark Jury hybrid. A compact earlier flowering maddenii type, Large open flowers of heavy texture in creamy white, flushed pink with green to yellow throat. Heavily perfumed, free flowering, weather hardy blooms with dark foliage. 1.8m Mid. Floral Legacy (sino nuttallii x nuttallii) Felix Jury hybrid. One of the largest flowered species. Huge trumpets are white with pale orange stain. Strongly scented. Very large leaves. Tender. Late flowering. 2m. Floral Sun (sino nuttalli x R W Rye) Mark Jury hybrid. A smaller golden nuttallii, fragrant trumpets in soft creamy gold. Floriferous and compact with mid green, bullate foliage and delightful peeling bark. 1.5m Mid. Katie (polyandrum x Sirius) Felix Jury hybrid. Compact and upright with distinctive creamy orange flowers on dark foliage. Many typical bell shaped flowers in loose trusses. Lightly scented. 2.5m Mid. Lollipop Lace (williamsianum x loderi) Les Jury hybrid, raised and registered by Felix Jury but never widely distributed. Rich pink frilly flowers on dark foliage. Slow compact growth. Moon Orchid (polyandrum x Sirius) Felix Jury hybrid. Excellent dark green foliage and elegant flowers. Buds are rose pink which remains suffused over the outside of the open flower, which is light yellow with a green turning orange blotch at the back of the throat. Lobes are waved to frilly. Scented. 2.5m Mid-Late. Platinum Ice (augustinii x maddenii) Mark Jury hybrid, bringing lilac blues into the maddeniis. Ice blue florets mature to white. Heavy textured large flowers, 4 or 5 per truss. The size of the maddenii flower but the form of augustinii. Lightly scented. Upright growth. Beautiful. 1.8m Late. Saffron Queen (xanthostephanum x burmanicum) Felix Jury form. While the original cross was done and named by C. Williams in the 1940s, Felix repeated the cross and came up with a better performing plant which is commonly the form seen in New Zealand at least. Bright yellow smallish flowers in abundance. One of the best pure yellows. Compact, freeflowering and sun tolerant. Puts on a magnificent display. 1.5m Mid. Soft Shadows (yakushimanum x argrophyllum) Carmine rose flowers fading to white. Compact growth, fawn suede indumentums on foliage. Never widely distributed. White Doves (scopulorum x inaequale) Felix Jury hybrid. White flowers with green-yellow throat. Very floriferous. Open growth habit and dark green foliage. Good form for Japanese style gardens. 1.5m Early-mid. A note about Les Jury hybrids. Les was Felix’s older brother and better known for his camellias. However he did a number of griersonianum grande crosses, including one which bears his name. None of these proved easy to propagate but they are excellent garden plants. Les named a macabeanum hybrid for his daughter, Joy Jury. Bernard Hollard distributed an unknown seedling as Jury No 9 (syn: Hollard’s No 9) which is presumably one of Les Jury’s seedlings. Red Felix is sometimes attributed to Felix Jury but not a Jury hybrid and has never been propagated here. It appears that the original scion may have been removed from a show table and put into propagation without Felix’s knowledge, let alone his agreement. It is not a Jury hybrid at all but it appears more likely that it may be a named cultivar imported from the UK.